It knows: The greatest mind in Rapture needs you. Explore Rapture's enigmatic technology centre, Minerva's Den, in an adventure that takes you to the core of The Thinker, the supercomputer that controls every system in the city. Unravel the mysterious past of its inventor and the tragic secrets concealed by the all-knowing machine he created. Play as a Big Daddy, Subject Sigma, in this self-contained story set in the doomed underwater city of Rapture. Face off against Fiery Brute and Wintry Houdini splicers as well as the Lancer, the most advanced Big Daddy ever produced by Rapture's genetic engineers. Expand your combat abilities with the chaotic Gravity Well Plasmid and the experimental Ion Laser gun. 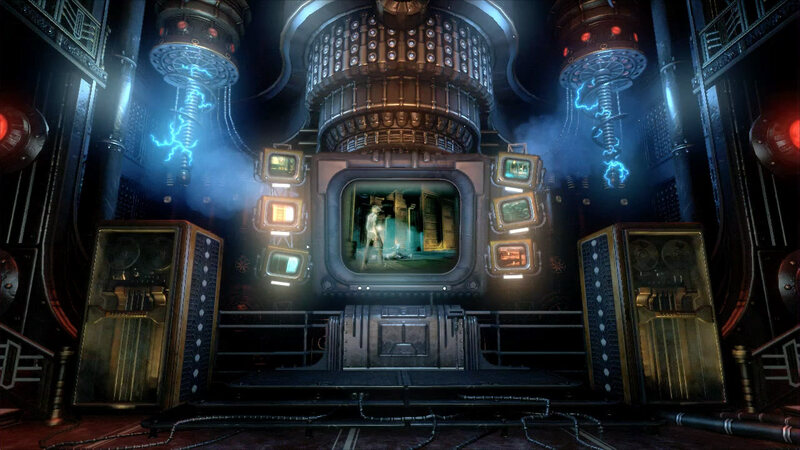 Minerva's Den requires BioShock 2 version 1.3. See this FAQ for more details. Clad in shining armour and equipped with a powerful Ion Laser, the Lancer is the most advanced Big Daddy ever to patrol Rapture's dripping corridors. From self-opening doors to pneumatic deliveries, Rapture Central Computing keeps the city running. A beam of concentrated energy from the Ion Laser stops this Splicer in her tracks. A message shows the way to your next objective, but is it an assurance or a warning? This Fiery Brute Splicer will expel a burst of flame whenever he's hit, so best to attack from a distance. A pair of unsuspecting splicers are caught in the Gravity Well plasmid's swirling vortex.